Those close to me know one of my favorite Bible scriptures is from the King James Version of the Book of Proverbs (29:18) which reads: “Where there is no vision, the people perish.” Much the same can be said about the relationship between a town’s vision and its budget. Without a well-planned and executed budget, the town’s vision will falter. Conversely, when there is a vision—one that has been clearly identified and articulated—the available financial resources become more efficient in achieving town goals. Indeed, prudent and effective financial management is among the most formidable tools for helping any municipality transform into a better place to live and work. Hilton Head Island is no different. I believe one of Town Council’s most important responsibilities is approving and continuously monitoring our budget, which provides the funding to implement the vision our residents wish to set forth. Ensuring that our community’s objectives and vision are preserved is precisely why proper budgeting is so vital. It’s not enough that we are concerned about the amount of taxes we personally pay, but we should also be mindful about how our money is being allocated to further enhance the objectives and vision that has been established to sustain and improve our quality of life. On June 21, following three intense months of development, editing and review, we finished this year’s budgeting process. Approval by Town Council was unanimous, and I am pleased to report that a good job was done by both staff and council. Our total consolidated budget of approximately $100 million represents the General Fund, Capital Projects and Debt Service Funds. It is about a $10 million increase over the previous year, but includes a $13.8 million increase in long-term capital projects for the island, incorporating several long-awaited projects such as paving numerous dirt roadways that still exist. I’m very pleased that we have been able to move forward on these long-awaited capital projects while also finding ways to underwrite some of Town Council’s new initiatives including $200,000 for the Venue Committee to consider the future of arts venues on our island; $100,000 for the Coastal Discovery Museum to promote historic Mitchelville; and some important enhancements of the Public Safety budget, which includes two additional sheriff’s deputies. As we all recognize, public safety is a cornerstone to maintaining a strong community. Town staff worked hard on this year’s budget, and their good job was achieved without having to raise the millage rate. Indeed, the town’s progress in decreasing its reliance on property taxes as a percent of revenue in the General Fund from 67 percent in fiscal year 1994 to 33 percent this coming year shows an ability to expand and diversify its funding sources. In my mind, the most significant of our new town initiatives is the Visioning Process for which we have allocated $400,000. 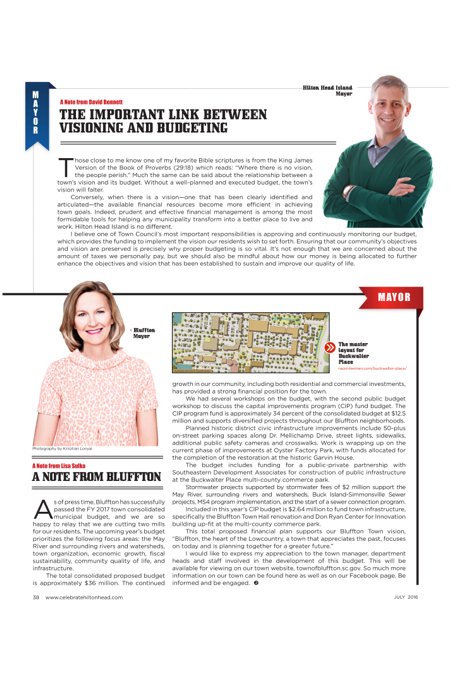 A visioning process is the best method for us to determine exactly what our Town of Hilton Head Island values, and as a follow-up, what our priorities should be for the coming years. Then, as we assess these values and priorities, we can more effectively decide, as a community, just how much we are willing to “budget”/pay for them. As of press time, Bluffton has successfully passed the FY 2017 town consolidated municipal budget, and we are so happy to relay that we are cutting two mills for our residents. The upcoming year’s budget prioritizes the following focus areas: the May River and surrounding rivers and watersheds, town organization, economic growth, fiscal sustainability, community quality of life, and infrastructure. The total consolidated proposed budget is approximately $36 million. The continued growth in our community, including both residential and commercial investments, has provided a strong financial position for the town. We had several workshops on the budget, with the second public budget workshop to discuss the capital improvements program (CIP) fund budget. The CIP program fund is approximately 34 percent of the consolidated budget at $12.5 million and supports diversified projects throughout our Bluffton neighborhoods. Planned historic district civic infrastructure improvements include 50-plus on-street parking spaces along Dr. Mellichamp Drive, street lights, sidewalks, additional public safety cameras and crosswalks. Work is wrapping up on the current phase of improvements at Oyster Factory Park, with funds allocated for the completion of the restoration at the historic Garvin House. The budget includes funding for a public-private partnership with Southeastern Development Associates for construction of public infrastructure at the Buckwalter Place multi-county commerce park. Stormwater projects supported by stormwater fees of $2 million support the May River, surrounding rivers and watersheds, Buck Island-Simmonsville Sewer projects, MS4 program implementation, and the start of a sewer connection program. Included in this year’s CIP budget is $2.64 million to fund town infrastructure, specifically the Bluffton Town Hall renovation and Don Ryan Center for Innovation building up-fit at the multi-county commerce park.